You’ve designed your website, set up shop, and you’re ready to start selling. The hard part’s over, right? Finding eager, devoted shoppers will be easy… think again. For every successful business out there, there are several similar ones that failed along the way because they didn’t pay attention to attracting, retaining and nurturing their customers. Increasing traffic to your store is tricky enough, and you also have to deal with engaging new shoppers, and of course, there’s the unavoidable risk of high shopping cart abandonment. Starting a business is nonstop work, but there are some easy ways you can use your website to increase conversions and get shoppers shopping. Give your visitors more than just a product — offer them the opportunity to start a relationship with your brand by sending out regular newsletters with information about new deals, photos of products and interesting news about what you’ve been up to. Over 95% of B2B and B2C companies use email marketing, and it has a ROI of 3800%. Email marketing is a hugely effective way to retain customers and spread the word about your company. Send out beautiful, well written newsletters to customers on a biweekly basis to make sure your first-time visitors keep you and your business in mind. Creating a nice-looking newsletter doesn’t need to be a full-time job — there are plenty of beautiful, intuitive templates available online into which you can easily plug your information. Don’t just write anything, but share content that will engage readers and make them feel special: include news, calls to action, and links to your social media. Share news about deals with your subscribers first — give them a reason to be loyal to you and keep coming back. And it’s really easy to get started. Using an easy Mailing List signup like POWr Form Builder, you can really quickly create an attractive, customizable signup on your homepage and watch the subscribers start coming in. 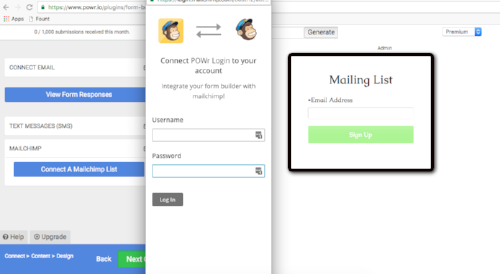 With just a click of a button, POWr Form Builder can connect to MailChimp accounts, making your email marketing campaign stress-free. It’s important to include links to your social media accounts on your website and in your newsletter. Keep things fresh and your shoppers interested by always maintaining active, engaging social media feeds. Figure out who your typical customer is and make sure you keep them in mind with each one of your posts on social media. Use social media to promote your own content and that of like-minded brands and businesses — and use each medium in the right way. If you have great images, up your Instagram game and start posting more frequently. Post your short, snappy quotes or links to Twitter, and share your longer form information on Google+. And make it easy for your visitors to find your social media. Use obvious hashtags and feature links prominently on your page. You can do this by adding linked social media icons to your website. This might seem obvious, but it’s important to double check and make sure the icons are somewhere obvious on every page. If your social feed has a similar aesthetic to the rest of your brand and your website, you can go a step further and embed your feed directly onto your webpage. Using POWr Social Feed, you can add many feeds in all one plugin, or have individual feeds dedicated to specific social media. Using POWr Social Media, you can also display posts sharing a common hashtag, so it’s an easy way to create an attractive gallery on your website that automatically refreshes and updates. Send sales shooting skyward with occasional and strategically timed flash sales. A flash sale is a promotion that lasts for a limited time only, and this sense of urgency and scarcity can turn reluctant shoppers into impulse buyers in no time. Reuters reported that businesses that conducted flash sales over the holiday season grew twice as fast as those that didn’t. Urgency makes people act quickly, and even suspend normal deliberate thought, according to behavioral psychologists. You can easily do this online by having flash sales, or letting your visitors know when your supplies are low. Adding a time limits and scarcity helped one entrepreneur increase sales by over 300%. And flash sales can help you out in more ways than one — take 50% off of a product you can’t seem to sell for one weekend, and watch your surplus disappear. They’re unbelievably effective, and they’re really easy to set up. Just add a Countdown Timer plugin to your product page, and the ticking clock will make your customers start shopping in no time. The human eye is drawn to movement. So add some animation and bring your customer’s focus to important information on your page with a simple popup. One blogger found that moving her newsletter signup from a sidebar to a popup increased her subscription rate by 1,375% in just eight months. Draw attention to deals, sales, social media accounts (anything where you need conversions) by putting them into a popup on your page. Shopping cart abandonment is something you’re going to have to contend in eCommerce, with even hugely successful companies seeing abandonment rates near 65%. An exit-intent popup is one that appears when a visitor tries to navigate off of your page — it’s using a split-second of misdirection and visual interruption to change minds and convince window shoppers to make a purchase. It’s crucial to include a call-to-action in your popup to redirect your users. Offering discount codes or free shipping to reluctant buyers in popups can be enough to see sales start increasing. Adding popups to your website doesn’t have to be hard at all. With this simple popup plugin, you can achieve either of those things in no time at all. You can use one of the templates provided, or start from scratch. Upgrade your account for a small fee and you can pick different triggers for your popup — the passing of a certain amount of time, a click, or the visitor’s attempt to leave the page. Running a business and maintaining a website is hard work — but it doesn’t need to be a total timesuck if you use the right tools to help you engage with more customers, create beautiful content and reel more clients in. Use plugins that are easy to customize, and keep things looking fresh by updating apps and changing the look and feel to best suit your website. This is a very nice list and I have already bookmarked this post to make changes in my website. Thank you for making such a lovely and informative post. You can also design and optimize your own ecommerce website by hiring professional developers. Also keep in mind that there are plenty of resources available online.